My roses bloom to Thanksgiving. My Indian free peaches rot really bad. I only get a few each year and plan to spray next year because they are excellent! This is the only fruit I have problems rotting. The only one I ate this year rot free was 25 brix so there is definitely room for improvement. 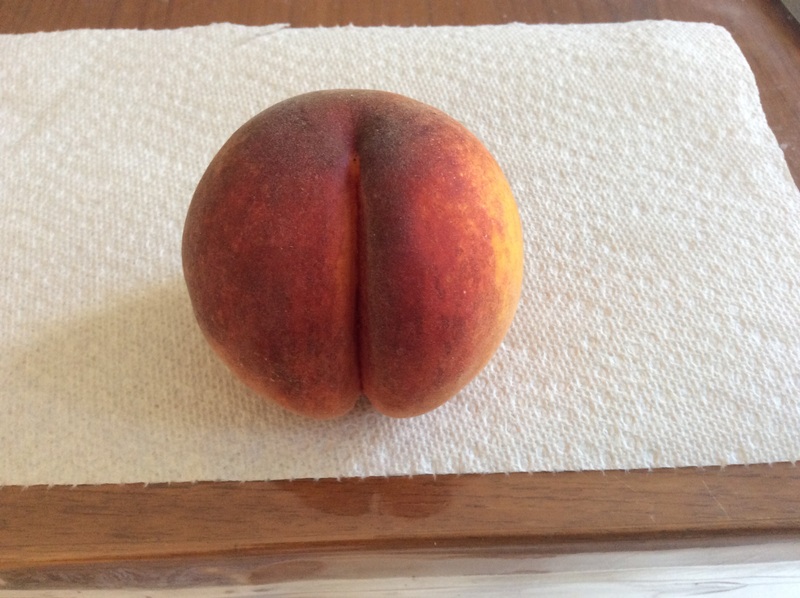 It is a very good peach! Carnival- I picked another which peaked at 19.5 brix. Heath Cling- 2 of the 6 fruit from the tree were on the ground today. One had some insect damage and when I cut it up, it was 16-17 brix, but not fully ripe. Not bad though. They are much smaller than the ones Alan was growing. But I think the brix is a bit higher, as his were 13-14 from what I recall (at least from the couple I tried). I ended up ordering Pumpkin Spice, a peach with “Orange skin gives way to red marbled flesh that has a surprisingly spicy flavor for all its juicy sweetness” and ripens in early October. I got it from Amazon (from Burchell, not a 3rd party), as not only the price was $5 less, but the shipping was lower ($41.50 vs $65 from the site). Even if I got 3 from the site, the shipping was just over $40 per tree, so Amazon was a better deal. My Autumn Star has been ripening this past week.The brix has been about 13 which has been good for this year, all things considered. Today, I ate one with brix at 17. I was thrilled. I thought O’Henry I had yesterday with brix at 15 was good. This Autumn Start was even better. Maybe, the more time, they hang on the tree, the more time they have to sweeten up. I am not complaining. Good question. My Indian Free looks ready. I tried a few and rather tart, but texture is good. Not sure if i should harvest or not? Has anyone tried Rick Landt peach? Ripens Mid to late September. Autumn Star has been ripening this past week. From what I found for AS, it is +40 days from Redhaven (in NJ). That puts it about Sep 10th for me- maybe a week ahead of you? One of the vendors at the Farmers market mentioned that he finished picking Victoria last Tuesday. He likes to leave them hanging as long as he can to get good color. Victoria is +47, about a week later than AS. I thought O’Henry I had yesterday with brix at 15 was good. This Autumn Start was even better. Was the O’Henry from storage or fresh picked? I thought it had a late Aug/early Sept window. I’m still holding off on picking my Carnival. But I’ve been checking it each day though for drops. The last one (2 days ago) ranged from 15 all the way up to 20 brix on the sun exposed side and was very tasty. The fact that Carnival is so close to ripe (or are already there) in late September, makes me glad that I went with the latest I could find from Burchell (Pumpkin Spice, in “early October”). Even that may not extend all the way to the frost, as DWN lists Carnival as Sept 25 - Oct 10 (in CA). @scottfsmith, how many times did you try to ripen Pei Xian Dong Tao before giving up on it as too late? Was the tree in full Sun? Bob, will you have any Carnival wood? My Victoria are almost done and Heath Cling doesn’t have a single ripe peach yet- they are much larger than yours and I suspect with much lower brix. Vic is unimpressive this year, to put it mildly, but this is probably a bad year to pass judgement. I’m surprised you are achieving the sugar you are, but mature healthy trees are a different beast- creating bigger fruit and tremendous access to water as the roots go deep for it. 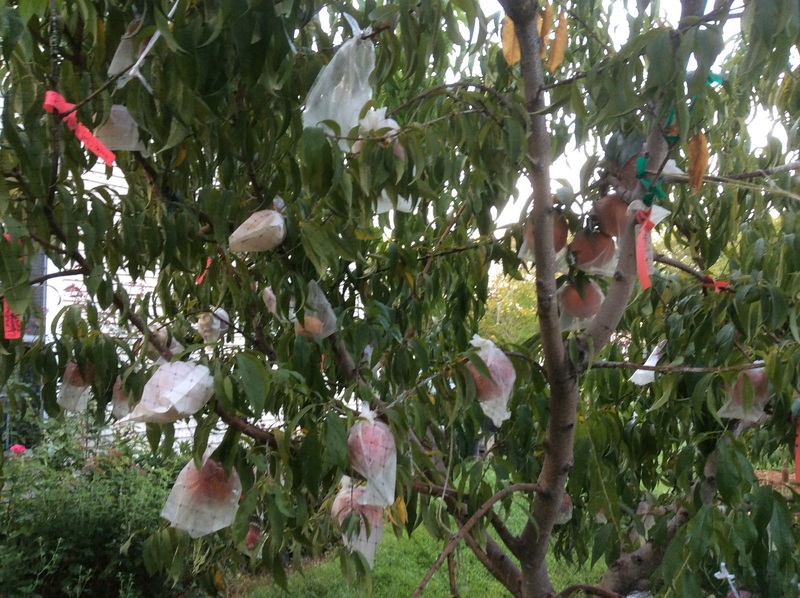 I wish people that show pictures of their fruit would also show pictures of their trees- there is a big relationship that isn’t being covered much in this forum. My trees are mostly healthy and vigorous and getting the same quality as from small more stressed trees may not be possible. They look like Olpea’s trees, only with higher trunks to keep above deer and completely unlike Fruitnut’s very runted specimens that create relatively small crops of amazing fruit. O’ Henry was fresshly picked, one dropped, one picked on the same day, 9/19. Ate one on 9/21. Probably will eat the 2nd one today. I still have one more hanging on the tree (grafted on Autumn Star). The grafted is in an obscure location. The fruit do not get direct sun. That could contribute to its late ripening? I do not know when O’ Henry is supposed to ripen. Mine is late. Here’s the last one on the tree. As for Autumn Star, this year, the fruit are mostly large, lot of 10-11 oz size. The first on dropped on 9/6 but it was not ripe. It could dropped because of heavy weight. 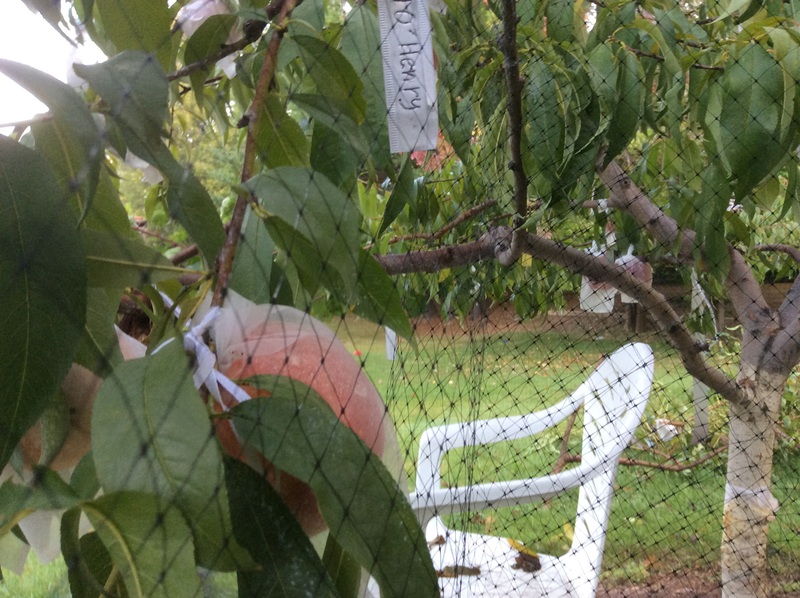 Today, 9/24, I still have half of the peaches on the tree. I picked them when they dropped into their bags, 3-5 of them a day, depending on how windy it is. I guess AS’s last pick could be as late as early Oct. this year. I did not have any peaches last year due to freeze. 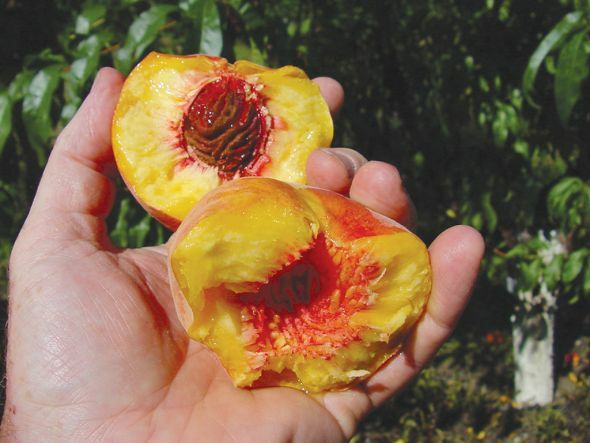 In 2015, most of my peaches were rotted. The date those rotted fruit dropped was around 9/12. Had they been no rot, the ripening time would be about the same as this year. ACN and Grandpa’s Orchard put AS as their latest peach variety on their ripening charts. Also, one more Madison is still on that tree, too. If you want AS wood , let me know. Brix between 13-17 on a very wet year, I am pleased. The rest of my Autumn Star today. The fruit do not get direct sun. That could contribute to its late ripening? In my experience, about a week of difference, and is something that can be used strategically to extend harvest. What do you call the area that divides thetwo side of peach? This is the 2nd Autumn Star that has this very deep dent. I know I do not use the right term but it is unusually deep. Don’t worry- I’ll have some wood for you. If you’d like, you can check out the tree yourself. There are two peaches left, after I picked a pecked/rotted one today (17-19 brix from the 2/3 which was good). If you stop by, I can give you a tour and you can sample a Carnival. I also found another damaged Heath Cling on the ground. 17 brix, but my wife wasn’t thrilled with it and said it was bland. I agree that the Carnival was better, but still think the HC is tasty and interesting. 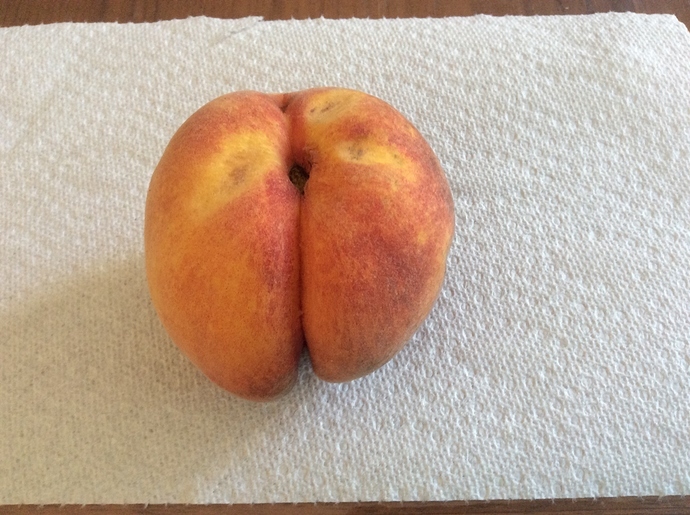 What do you call the area that divides thetwo side of peach? I know I do not use the right term but it is unusually deep. I remember the pic. My husband called it a plumber’s crack. Brady, thanks for the info. Davis calls it deep suture. One of the vendors at the Farmers market mentioned that he finished picking Victoria last Tuesday. He likes to leave them hanging as long as he can to get good color. Bill Shane claims Victoria can get overmature flavors if left on the tree too long. I haven’t noticed it, but I do pick Victoria a little earlier than a lot of peaches. It tends to drop really bad here if left too long. I’ve also noticed, like many other late peaches, it tends to remain firmer no matter how long it’s left on the tree. There are many factors to get right in order to deliver a delicious peach. That was a good article, some comments. I like red flesh and you can keep it red with lime or lemon juice which I add to anything canned or frozen. I do this with all fruit. Anybody who makes guacamole and leaves the lemon or lime juice out will never do it again. My Arctic Glo tastes great overripe, maybe even better overripe. Others not so much. Thank you, Olpea for the links. A couple of my AS had very deep sutures. I tend to let peaches hang until they start dropping. Maybe, Victoria is not for me. My early ripening Indian Free almost all are full of worms. I haven’t looked closely enough to ID but am guessing they must be OFM because PC would already be done and they can’t be coddling because fruit lacks the normal entry point. No other late (or anything earlier) has this problem, including Victoria and Heath Cling. I wonder if IF is particularly attractive and will require more spray. Looks like I may not have much of an IF crop after all and will have to settle for Heath Cling as latest peaches. They haven’t started ripening yet but are just about to. You might be seeing one more generation in your latest peaches. Its a big problem for me, I don’t spray later in the season and the OFM population builds up. Both IF and Heath get bad bugs nearly every year for me. Its one factor on why they rot more as well. Yes, most of the fruit with worms have rot, often destroying the entire fruit. Never been a problem before. Good thing this warm fall is a total fluke, right? If this represented some kind of trend we fruit growers might be in some trouble. That article link is very interesting. They mention cold tolerance, harvest date, fruit quality, yield, and other parameters that can be effected by the rootstock. Adding that to climate and soil parameters explains why there is so much variation in our experiences as growers.